Pros: Good HDD, not that noisy. Pros: Has lasted longer than I expected. It's sturdy and reliable. I've done some real funky formatting on this thing and it's never had a problem. Other Thoughts: I recommend grabbing this while it's still available. Pros: Works as advertised.. very quiet drive. I'm planning on buying more some time in the future to run Raid5. Other Thoughts: Very affordable, great performing SATA 300 drive. Pros: This is the second deskstar I have installed in a system and I love their performance. I look at my HDD LED to see if it is running because it is difficult to hear it running. Other Thoughts: Newegg is very reliable. I can't say enough about them, you just have to make the decision to switch, it's that simple. Just check the web for reviews before selecting a model, that goes for any major computer part. What more can someone ask?? Hitachi Product support is second to none. Disc Tools are readily available for download to anyone. Drives are easily configured via software instead of the small jumpers we used to have to work with. Other Thoughts: I was a WD diehard, as I said, but decided to give Hitachi a try. I had many years of great luck using there optical drives. I made the choice and checked many reviews before building this system, all were 100%+ positive, one of which was Anantech if memory serves me correctly. Hitachi has been a leading innovater in HDD technology since it's inception. More leading brand Laptop Computers have been sold with Hitachi HDDs installed in them than any other HDD made. I think that alone gives them bragging rights!!! These drives are not made in China as most are today but come from Malaysia & the Philippines. Buy just one and you'll be spoiled for life!!! These are by far the quietest drives I have ever had the pleasure of owning or working with. Plus if buying in small quanities you get one of the best online suppliers around, Newegg where price, & customer service are job one!!! Pros: Very quiet after setting the Acoustic Management. Good suport and software from Hitachi's website. Reliable low cost quiet drive with good performance. SATA and Legacy power connectors. Cons: The data rate must be switched to or from 1.5 to 3.0 gb/s via software. If your drive is set to 3.0 and your computer only supports 1.5, there is no way to change it without using a different computer. Other Thoughts: After setting the Acoustic management to quiet mode, this is one of the quietest drives I've heard. Great for a bedroom PC or anywhere quietness is desired. The software used to configure this drive is better than other manufacturers I've used. Pros: Capacity/price is great. Plug and play. Great customer service at hitachi. No trouble getting through, answered all my questions patiently and clearly. Cons: Not that quiet. This thing does not have jumpers and requires a software download from hitachi in order to enable 3.0 GB/sec. You have to boot up with the Features Tool from hitachi. Annoying and not that simple. 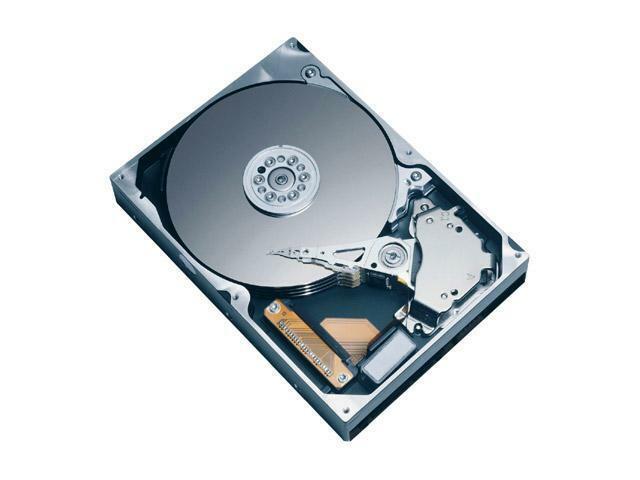 You are buying a SATA II hdd, but receive a SATA I hdd. Cons: Bought 2 drives, 1 failed within 2 months. It will no longer spin up. Drives also only have 8 MB cache. Other Thoughts: Cheap, not super fast and not reliable. You get what you pay for!